The Aspen is a refined beauty that boasts a finished space of 2,213 square feet. The design, which has a total area of 3,183 square feet, features a garage that can accommodate up to 3 cars. The main floor has a spacious living area with an island kitchen, dining space, and family area. It also has a walk-in closet and separate room that can be turned into a den or a formal living room. The second floor features a total of 4 bedrooms, including the master bedroom. 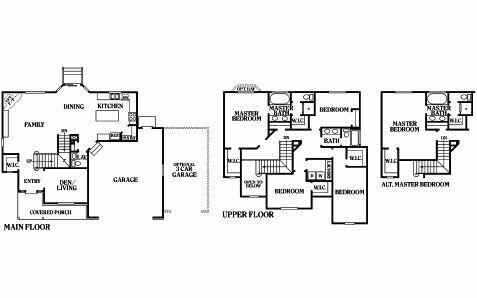 The master bedroom has a master bath and 2 walk-in closets, while 2 of the remaining rooms also have their own walk-in closet. The house plan has a total of 2.5 baths. The family area can be outfitted with an optional fireplace that will make the room more inviting to guests and family members alike. Also, homeowners can opt for a second-floor layout that will make the master bedroom roomier. Perry Homes Utah understands that buying a home is a big decision, that’s why our company has made the commitment to make the whole process easier for our customers. We offer charming house plans with plenty of customization options, as well as financing options. Our design specialists personally work with our clients and give them a thorough walkthrough of the design options for their new home. This way, they won’t have to worry too much about how they can make their new home truly their own. Enjoy a seamless home-buying process and the expertise of a trusted heritage home builder with Perry Homes Utah. For inquiries about the Aspen or our other two-story house plans, just call 801-264-8800 or leave us a message on our Contact Us page.